Deric's MindBlog: Language can boost unseen objects into visual awareness. Language can boost unseen objects into visual awareness. Linguistic labels (e.g., “chair”) seem to activate visual properties of the objects to which they refer. Here we investigated whether language-based activation of visual representations can affect the ability to simply detect the presence of an object. We used continuous flash suppression to suppress visual awareness of familiar objects while they were continuously presented to one eye. Participants made simple detection decisions, indicating whether they saw any image. Hearing a verbal label before the simple detection task changed performance relative to an uninformative cue baseline. Valid labels improved performance relative to no-label baseline trials. Invalid labels decreased performance. Labels affected both sensitivity (d′) and response times. In addition, we found that the effectiveness of labels varied predictably as a function of the match between the shape of the stimulus and the shape denoted by the label. Together, the findings suggest that facilitated detection of invisible objects due to language occurs at a perceptual rather than semantic locus. 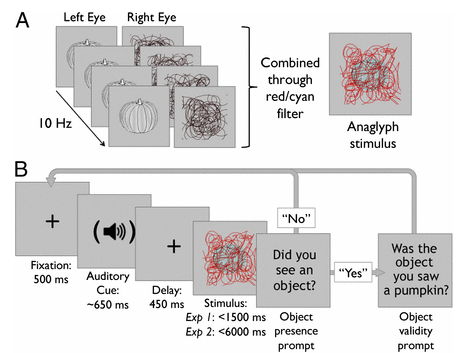 We hypothesize that when information associated with verbal labels matches stimulus-driven activity, language can provide a boost to perception, propelling an otherwise invisible image into awareness. Continuous flash suppression was implemented using anaglyph images: participants wore red/cyan glasses and viewed stereograms containing a high-contrast red mask (∼9° × 9°) and—on object-present trials—a superimposed lower-contrast cyan object (Fig. 1A). Only the object was visible to the right eye and only the mask to the left. The dynamic mask comprised curved line segments, with frames randomly alternating at 10 Hz. Because similarity in spatial properties between stimuli and masks is important for effective suppression of stimuli (72), line segments were used to better mask the curvilinear character of the objects. (A) Stimulus creation using continuous flash suppression. (B) Basic procedure of experiments 1 and 2. Aspects of our musical experience. Virtues of coffee and coffee shops. The cognitive benefits of movement reduction. Numerosity is represented in our parietal cortex. Nighttime light impairs our emotional responses.